To many American students studying abroad there is one cultural difference that is most apparent: the drinking age. Acknowledging that this could be an inappropriate topic or one that someone reading a cultural blog has little interest in hearing about, I’ll tread lightly and keep this as post as sociological as possible. We all know the drinking age in the United States is 21 and over, and that that makes us somewhat of a global minority, since most other countries have drinking ages that are 18 or even younger. This has been interesting to observe from my new perspective at a university where the entire student body is of legal drinking age and how that affects the way students view the use of alcohol. The Danes love their beer, and I have a few reasons for how I came to this conclusion. I mentioned in an earlier post that I’m attending Copenhagen Business School this semester and they have corporate partners just like any other university. In company with Danske Bank and Deloitte, one of CBS’ seven major partners is none other than the Carlsberg Group, the makers of the most popular beer in Denmark. I’ll get back to them later. Last week, exchange students were invited to purchase a social program consisting of activities to help us bond and get to know each other. At the meet and mingle night (glorified speed dating) they set up a bar in the classroom building. The social booklet also informed us that we could bring out own beverages to Danish folk dancing night. We had a student organization, the equivalent of Student Activities at Richmond, give a presentation at orientation about the social culture here. As you might have guessed by the progression of this post, the girls’ presentation was oddly centered around where you can drink at CBS, what it means to them culturally, and how at the welcome party we will find their very own university president handing out Carlsberg’s. The welcome party is a whole other story in that they clear out the CBS academic building Solbjerg Plads on Thursdays and transform the place into the largest bar in the city of Copenhagen. Mind you, this is a building many students will return to hours later to partake in their Friday classes. I worry that by writing this post I will seem like another uncultured 20 year-old American student fixated on alcohol consumption, but I truly have found this topic intriguing. It’s a common thought in the US that our issues surrounding drinking (i.e. binge drinking, drinking and driving) come as a direct result of our higher legal age. We laude places in Europe for being way “classier” in their drinking because to young people, it is simply part of their national culture. Since young people drink with their families and have casual drinks with dinner they become immune to the perils we have in the States. Does this sound familiar? I certainly said it, and it’s true to an extent. While I wouldn’t fantasize it as much as I had from afar, it’s true that alcohol here, namely beer, is extremely engrained in Danish culture. 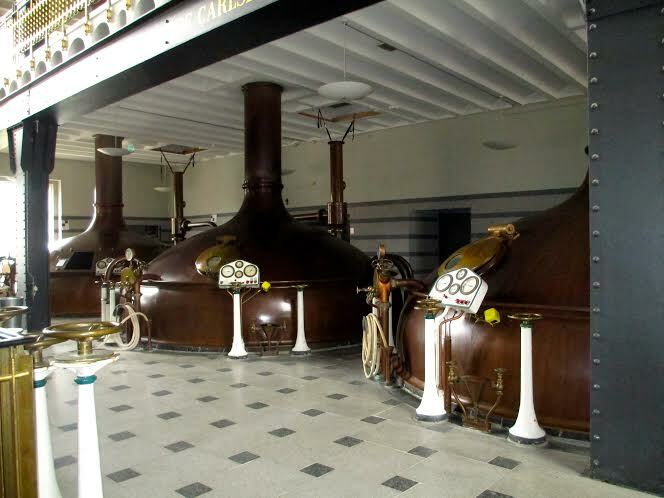 The aforementioned examples should illustrate how important beer is to Danes, but another place I saw this was on a trip I took to the Carlsberg Factory. We took a guided tour around the factory that was used for Carlsberg production up until 2008 and heard the surprisingly dramatic tale of the Jacobsen family that started the empire. 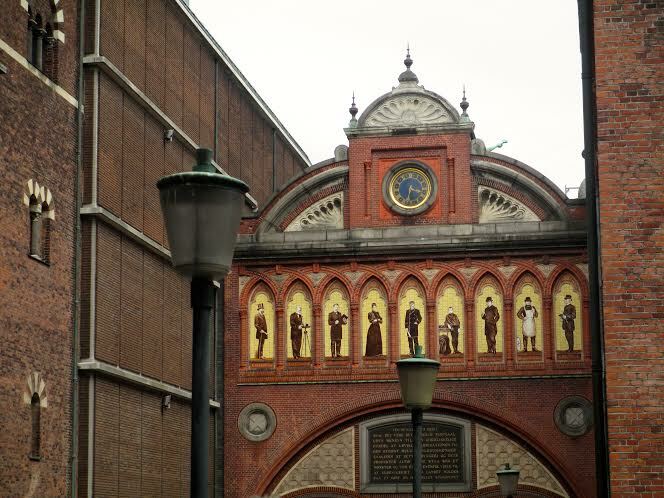 They experienced their share of family issues (I would recommend reading the story if you have time), but the men did remarkably well for themselves and created a site full of beautiful, expensive, artistic, and elaborate buildings that exemplify how they perceived their importance as brewers. 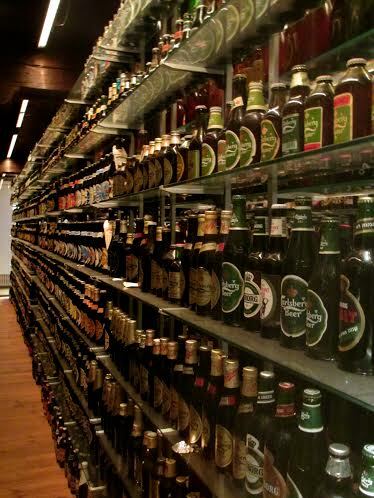 Carlsberg is now the fourth largest brewery in the world, outdone only by Heineken, SABMiller, and Anheuser-Busch. Brewing has recently moved from this location and their plans for what to do with the factory demonstrates how beer is such a cultural staple. They are going to make a Carlsberg city. Our tour guide promised that if we were to return to the Carlsberg factory in 16 years we would find it filled with apartments, houses, universities, preschools, grocery stores, and anything else you would imagine being in a small city. This news rendered me speechless, but it shows the cultural influence this corporate behemoth has in Denmark. Time will tell if this endeavor will be successful, but the belief in the cause is enough to show that beer here has an importance that far surpasses that which we have in America. Denmark is literally building a city on the foundation of its favorite starchy drink, and that’s certainly a cultural difference from America in my eyes. This entry was posted on Tuesday, September 2nd, 2014 at 3:42 pm and is filed under Diana in Denmark, Fall 2014. You can follow any responses to this entry through the RSS 2.0 feed. You can leave a response, or trackback from your own site.